Exercise is anything you do to move and improve your physical health. There are 4 different types of exercise: Aerobic, strength, flexability, and balance. Ideally, you should be doing something from each group to maintain functionality. The Big Box gym is a good choice for someone who wants a lot of equipment for a low price. They usually have machines, free weights and cardio equipment. Most also offer classes. The up side is that there is a wide variety of equipment and you can usually find something that you like to do. The down side is that you are pretty much on your own. Most do have trainers on the floor who can show you how to use a piece of equipment, but, for the most part, these are do it yourself kinds of gyms. Boot Camp classes are a form of group physical training. They are a type of interval training, where you alternate between levels of intensity. It combines calesthenics, like pushups and jumping jacks, with body weight exercises, like squats and lunges. It also usually has some strength training components. It is a full body workout and the intensity level can be high. Expect a good sweat from this workout! Barre class combines pilates, yoga and ballet in a fun, energetic workout. You will use a ballet barre in addition to small hand weights and some exercise equipment like small exercise balls or resistance bands. The movements in Barre are small, isometric movements which engage the muscle without tearing it. It's efficiency comes from the fact that you are doing multiple movements at once, holding, pulsing, stretching. Crossfit is essentially varied functional movements done with high intensity. It combines features of weightlifting, gymnastics, running and rowing. Crossfit was designed to enhance your competency at physical tasks. It increases strength, stamina, flexibility, power, speed, coordination, agility, balance and accuracy. The Crossfit community is a tightnit group of people who support each other. While some people may be intimidated, it is generally a welcoming group and all the movements can be scaled to your own fitness level. HIIT Training is based on the premise that interval training is more effective than sustained exercise. It alternates low or moderate intensity exericse with high intensity exercise. Interval training increases aerobic and anaerobic capacity. Barbell complexes and tabatas are examples of interval training. HIIT training is a good way to burn fat and build muscle. Kickboxing is a form of martial arts that combines kicking and punching. It is a fighting sport. The kickboxing that you see in gyms is cardio kickboxing. The kicking and punching is done with music and you are usually doing some sort of body weight exercise in between rounds. Also, you are hitting a heavy bag, not other people. It is an excellent cardiovacular workout. Running is, well, running. It is moving at a faster speed than walking. Some run at a steady state, usually for distance. 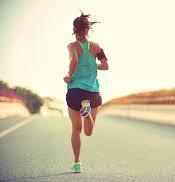 Others, run very fast for short distances, called sprinting. Interval training combines fast and slow running and is an excellent way to burn calories and get fit. Spinning is an indoor cycling class set to music. It is a tremendous cardiovasvular workout, but can be customized to each person's individual fitness level. You do a series of "sprints' while cycling, and alternate between standing and sitting while pedaling. You also vary the intensity while cycling. This is a fun, intense, cardio burning workout. When you begin an exercise program for health, you don't have to jump into the hardest fitness classes out there. 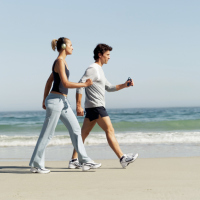 A 21 minute walk 5 days a week can cut your cardiovascular risk by 30%. It is a low impact way to get fit and can be started with little monetary outlay. I do recommend you invest in a good pair of walking sneakers though. I usually recommend a 20-30 minute walk after dinner. It will help digest your food prior to going to bed. Yoga is an ancient Indian method of harmonizing the mind and body through yoga postures, meditation and breathing techniques. The yoga poses are said to purify the body and give it the strength and stamina to meditate. Yoga will give you strength and flexibility and enable you to transition into mindfulness. It is a great workout for those who need a low impact type of workout. Pilates is great for improving flexibility and strengthening your core. Like yoga, practitioners of pilates espouse the mind body connnection, but pilates is a little more intense workout. Pilates consists of a series of body movements designed to activate the core muscles of the body. It emphasizes lengthening the body and aligning the spine. It is a great low impact workout and is good for people who have low back issues. Swimming is great for people who need a low impact workout. It is a cardiovascular workout and improves endurance. 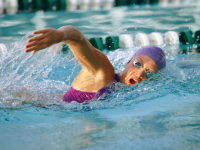 Because you propel yourself through the water, it is also consider resistance training. Swimming works your arms and legs as well as your core. It is a good workout for those with back issues. Many big box gyms have a variety of aerobics classes in them. Aerobics classes are high energy group classes that keep you moving for the length of the class. Step classes have you stepping on and off a step throughout the class. You may use light weight with choreographed moves. There are belly dancing, Zumba and Hip Hop dance classes as well. Many gyms also offer senior classes that are less intense, but will still improve cardiovascular health. Powerlifting is an anaerobic exercise, which means it depletes the muscles of oxygen, making them bigger and stronger. Powerlifting is a "we pick things up and put them down" type of sport. Your goal is to lift, deadlift, squat and bench press, a one repetition maximum (rep max). Meaning, you lift as heavy as possible one time. Powerlifters tend to do heavy lifts for shorter repetitions to build their muscle capacity. This type of exercise strengthens muscle and bone. Kettlebells are cast iron balls with a handle. You swing them in a variety of moves designed to blast fat and build muscle. A kettlebell workout is a functional workout, which means the movements you do work your muscles the same way they move in everyday activities, like lifting and carrying groceries. This is a great workout to tone muscles, especially in the core. A 20 minute kettlebell session can burn 400 calories! TRX is a bodyweight type of exercise using suspension straps. It was created by the Navy Seals to improve strength, endurance and core stability. The straps hang from the ceiling and you use your body weight as resistance. Because the straps have 360 degree mobility, it engages multiple musle groups at once to give a great core mobility workout. TRX is a total body workout. Many personal trainers incorporate TRX bands in their overall workouts.